Available from late September, the world's favourite roadster upgrades powertrain, dynamics and safety across Roadster and RF variants. Mazda MX-5 has applied advanced technologies to each of its engines, SKYACTIV-G 2.0 and SKYACTIV-G 1.5, to extract maximum power balanced with linear response to maintain its Jinba-ittai sensibilities. Looking to replicate the free-revving feel of the 1.5L, engineers thoroughly revised the SKYACTIV-G 2.0, ultimately lifting the red line to 7,500rpm, boosting power from 118kW to 135kW and torque from 200Nm to 205Nm. The comprehensive update saw changes made to the air flow intake and exhaust systems, piston shape and weight, crankshaft and connecting rods, achieving increased air intake, improved combustion speed, reduced exhaust losses and mechanical friction. SKYACTIV-G 1.5 was also revised, with some of the same technologies applied to piston shape and combustion chambers, accounting for an increase in power from 96kW to 97kW and a boost in torque from 150Nm to 152Nm. SKYACTIV-G 1.5 is available exclusively with the entry-level Roadster, while Roadster GT and all RF variants are equipped with the more powerful SKYACTIV-G 2.0 engine. To match the extra power under foot, manual and automatic transmissions were revised to deliver a sharper response and more direct driving feel. Plus, shift timing at turn-in and torque control at turn-out have been tuned for greater precision in sporty driving situations. 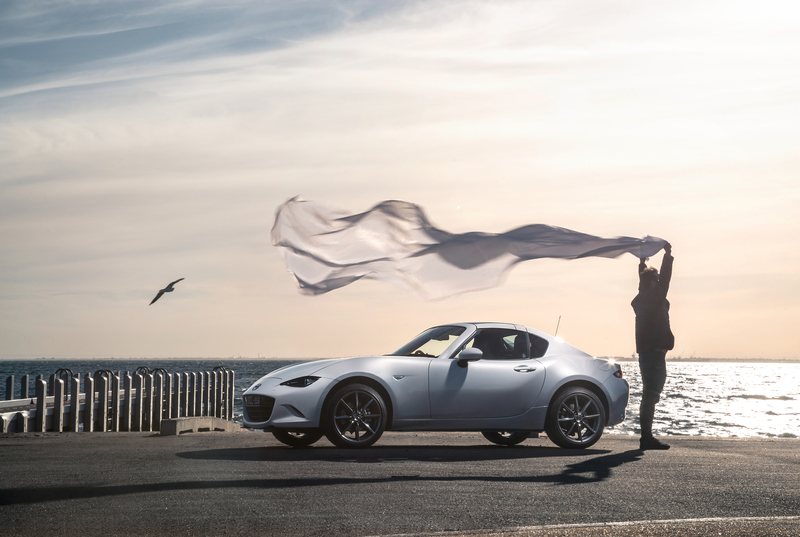 Deepening the connection between car and driver further, New Mazda MX-5 introduces telescopic steering, making it easier to find the ideal driving position. Mazda Australia Director of Marketing, Alastair Doak, said the update gives a driving experience that is true to the original. "Every time we update Mazda MX-5, it's in pursuit of refining and enhancing the thrilling drive that is so unique to our iconic two seater," said Mr Doak. "Added power has been finely balanced to ensure the same smooth, direct response is felt from the moment the throttle opens up." Mazda MX-5's five star ANCAP safety rating has also been bolstered, with the addition of a rear camera to all grades, and more advanced i-ACTIVSENSE safety technologies to the standard safety package, including Smart City Brake Support [Forward] (SCBS-F) and Traffic Sign Recognition (TSR). New-look 16-inch alloys with a black metallic finish are available for the 1.5L Roadster, while RF gets 17-inch wheels also finished in black metallic. Roadster GT and RF GT models sit on 17-inch wheels with a bright silver finish. The detachable cup holders have been made more rigid for less wobble and easier to fasten and remove, while seat levers have thicker internal frames to give a more assured feel when operating. There are five interior trim options for MX-5, with Mazda's Chroma Brown nappa leather available as an option for RF GT. New Mazda MX-5 is available in a choice of six exterior colours, including Soul Red Crystal Metallic, Machine Grey Metallic, Snowflake White Pearl Mica, Ceramic Mica, Eternal Blue Mica and Jet Black Mica. RF GT variants also have the option of a black roof for an even sportier look. Available from late September, New Mazda MX-5 has a starting price of $34,190* for the 1.5L Roadster, with the RF GT topping the range at $48,960*. For more information about New Mazda MX-5 or to find your closest dealer, please visit www.mazda.com.au. 2018 Mazda MX-5 adds more power, torque and tech, delivering on its promise of a thrilling, top-down driving experience.